Yellow fever is a serious viral haemorrhagic disease, which is transmitted by Aedes mosquitoes (WHO). 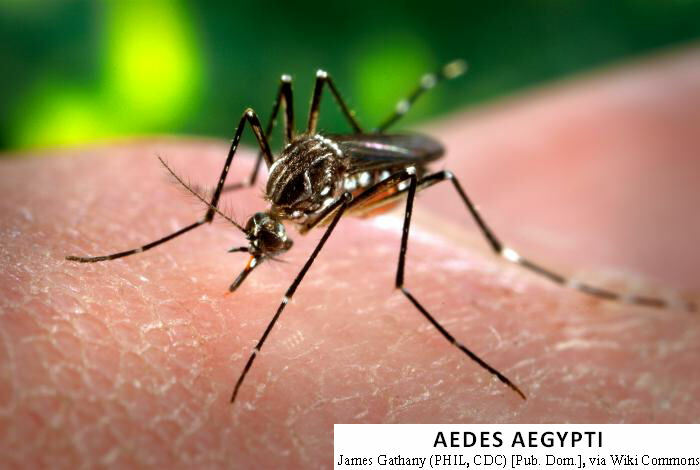 It is endemic to Africa and Latin America, but has the ominous potential to spread to any other part of the world where its vector, the Aedes mosquitoes thrives. All persons who live in or plan to visit countries where Yellow Fever occurs must get themselves immunized (vaccination) against this dangerous disease. You must follow the rules in your own interest and in the interest of others. 1. Avoid being bitten by mosquitos, by mosquito-proofing your windows. 2. Prevent proliferation of mosquitoes, by emptying water from any open containers left in the open. 3. Car tyres lying around in any position will hold rain water, and this water cannot be easily emptied. Therefore, if you want to keep old tyres out in the open for some genuine reason, you should either cover their open area fully or puncture large holes everywhere so water cannot accumulate in any position. 4. Grow mosquito-larva eating (larvivorous) tiny fishes such as gambusia or guppies in your garden pools or any open accumulation of water, which cannot be emptied, in and around your premises. These larvivorous fishes do considerable service by eating up all mosquito larvae in the water. Visit the following pages of this website for other common mosquito-borne diseases.